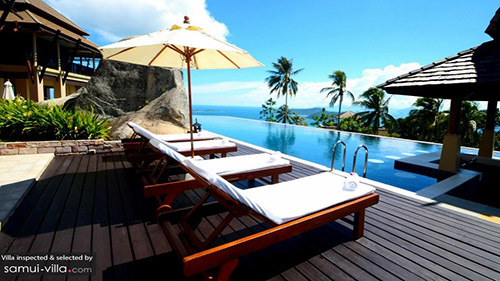 Outdoor spa salas, a private pool of your own, gorgeous bathroom facilities, spectacular vistas of the sea and direct beach access – these nine luxury villas in Samui come with all the right features to make your stay an unforgettable one. Angthong Villa would not look out of place in an interior design magazine; the villa features pretty Oriental elements, breezy open plan living pavilions and delightful outdoor spaces. 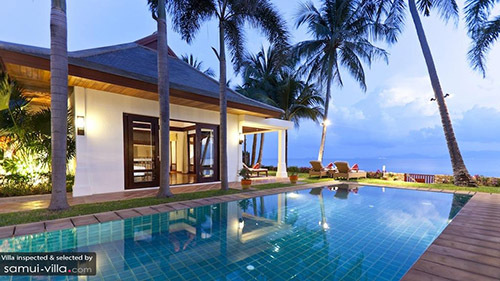 A pool hugs close to the shores, providing guests with panoramic views of the ocean as they take a refreshing dip. When you’ve finally decided to step out of the pool, dry off against the beach towel and relax against the loungers with an icy drink in hand. 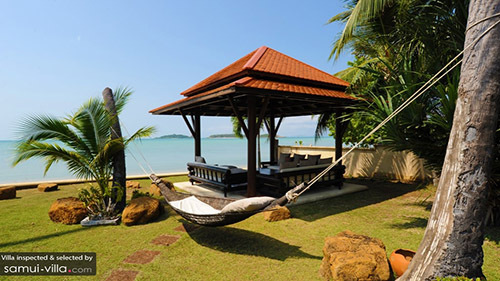 If you feel like catching a quick snooze, a swinging hammock in the garden provides the perfect spot. Ban Kilee‘s got all the makings of a luxurious holiday home. A spacious infinity pool, swim-up bar, panoramic ocean views, direct access to the beach, well-manicured garden – this villa’s got ’em all. The main swimming pool offers plenty of space for the entire clan to make a splash, but if you’re one of those who like having a pool all to yourself (so do we), there’s a second pool located to the side of the villa. You’ll have to plan your days well here, for the villa offers much to do. Should your free time be spent catching a movie marathon in the media room, enjoying cocktails by the bar, lounging outdoors by the poolside or catching a snooze in the plush bedroom? Perched atop the mountains, Samui Ridgeway Villa‘s elevated position puts guests in the perfect spot for enjoying the scenic surroundings. Whether you’re lying back against the sun loungers, taking a dip in the refreshing waters of the infinity pool or working up a sweat on the fitness bike, you’re bound to enjoy vistas of the stunning coastal scenery. This luxe abode features a plethora of plush amenities too, which means that you’ll have endless choices when it comes to spoiling yourself silly. 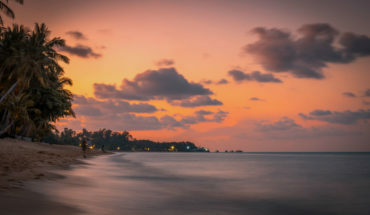 So go ahead and indulge in massage treatments at the in-house spa villa, enjoy soothing floral baths in the finely-appointed bathroom and decadent dinners in the expansive dining area. Made up of sleek and spacious living areas, luxurious amenities and jaw-dropping views, Villa Samujana Neung is the perfect tropical retreat to escape the city blues. The minimalist interiors – featuring clean lines, creamy hues and simple ornaments – are easy on the eye, and draw one’s gaze out towards the surrounding coastal scenery. Make this vacation a relaxing one by scheduling in plenty of downtime; relax by the pool, curl up on the couch with your favourite book or perk up your energy levels with a quick workout in the gym. Sangsuri Villa Estate is a sprawling complex made up of three villas that may be rented together or separately. This gorgeous vacation rental is equal parts homely and luxurious. Indoors, you’ll find cosy touches like pillowy couches, soft rugs and tasteful ornaments, while the outdoor area offera enviable features such as a beachside spa, sun-drenched pool deck and oceanfront pool. You’ll enjoy watching the waves as you take a dip in the cool waters of the pool, but if the temptation of hitting the coasts is too great, simply traverse the path leading to the shores, for this villa offers direct access to the beach. Stunning Villa Wayu presents a jaw-dropping sight. The Thai-style roofs and Asian ornaments lend an oriental touch to the contemporary interiors of the villa. A total of seven bedrooms makes this an ideal vacation home for hosting a crowd, and if you’re bringing your littles ones along, there’s ample space for accommodating six children in the kids dormitory. Luxe facilities such as a massage sala, state-of-the-art media room and gym means that you’ll have plenty to do during your stay. 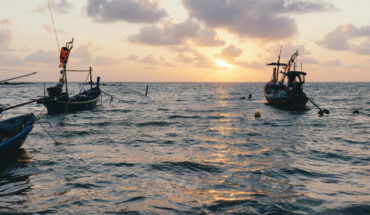 The villa is located a short walking distance away from attractions such as Mae Nam Village, but really – why venture out when everything you need is right here? 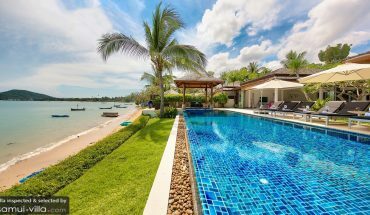 Unobstructed sea views, direct access to the beach, an oceanfront pool – Villa Frangipani Samui is a dream home for sun seekers and beach lovers. The best days here start and end by the beachfront: kickstart your mornings on an invigorating note by taking laps in the seafront pool, spend the afternoons upon the loungers with your favourite beach reads, chill out by the poolside in the evenings with a sundowner in hand, and tuck into a beachside dinner along the coasts under the starry night sky. Clean lines, minimalist design elements and a colour palette comprising mainly of pristine white and soft cream hues make up the paradisiacal Celadon Villa. When a vacation home occupies such an excellent location, a simple decor is the perfect option, for it brings out the beauty of the surroundings. Where ever you go – be it the spacious sunken living area, plush bedroom or sun-soaked pool deck – you’re bound to enjoy mesmerising views of the clear blue skies and sparkling ocean. When night beckons and you want some quiet time with that special someone, lay back against the loungers on the quiet terrace and bask under the soft glow of the moonlight. Just as its name suggests (ban suriya translates to mean ‘sunshine house’), this vacation rental exudes vibes of warmth and cosiness. Its prime beachfront location means that guests can venture out to the sandy shores at any moment of the day, and a sparkling turquoise pool serves as the ideal spot to cool down from the tropical heat. 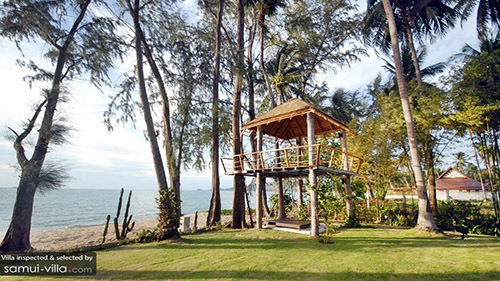 Features, such as an elevated sun deck, tree house with massage sala and a well-equipped fitness room (you get very your own Muay Thai punching bag and TRX brackets here) places this holiday home a cut above the rest.